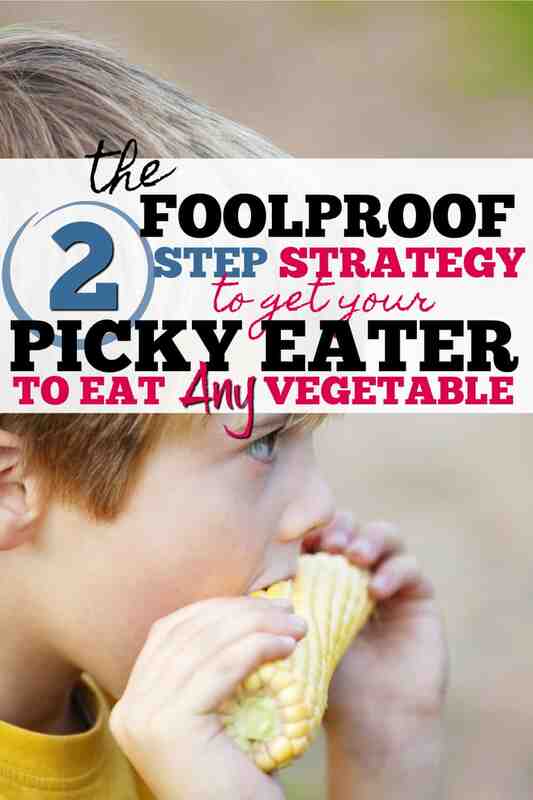 You are here: Home / Healthy Living / The Two Step Strategy to Get your Picky Eater to Eat their Vegetables. 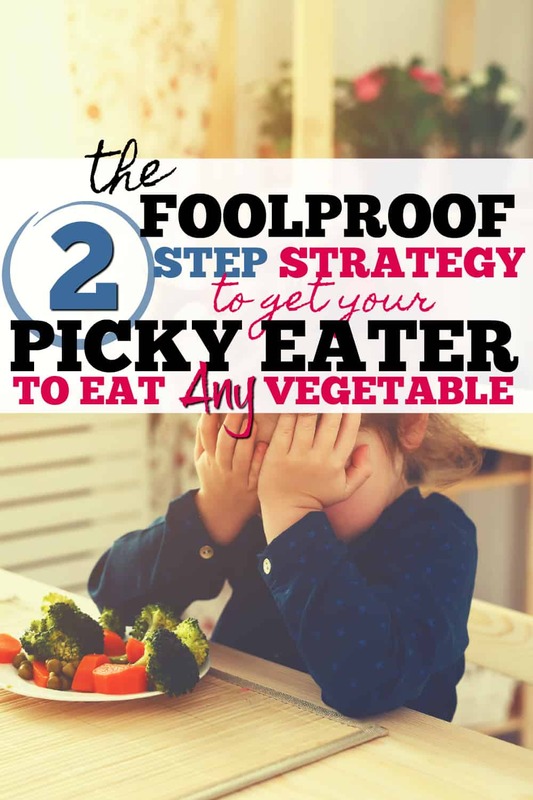 The Two Step Strategy to Get your Picky Eater to Eat their Vegetables. October 5, 2017 This post may contain affiliate links. Watching your kids push the embarrassingly small piece of (now cold and sad looking) broccoli round and round their plate and listening to them whinge and whine about how they “just can’t” eat their vegetables is frustrating and exhausting. It turns every meal into a battle and can leave you seriously doubting your abilities as a Parent. You need a game plan — a simple dinner time strategy that will help you see the bigger picture. No more self doubt and second guessing – just a simple, no fuss, step by step plan to get your kids to eat their vegetables. So, if you have had enough of giving in to the whims of your fussy eater, then here is my Two Step “Learn to Eat Vegetables” Strategy and a real life example of it in action. 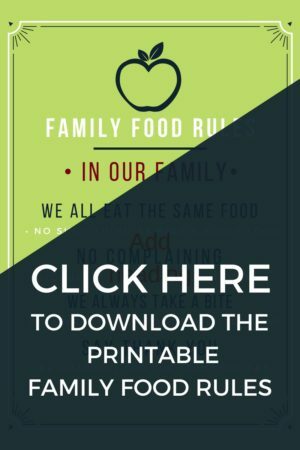 Before we dive into the nitty gritties of it, here are our four Family Food Rules that I’m going to share with you. These rules apply to every meal time regardless of where we eat (home or Granny’s house). Feel free to print them out and use them in your home too. I have made a nifty (I swear this word is not used enough) little printable to remind everyone of the rules. You can get instant access to it below. Everyone eats the same thing in the family. No more making separate meals or tweaking it for individual tastes. From now on it is one meal for everyone. There is no such thing as a ‘Kids Menu’. No Complaining about the food we are served. It is impolite and insulting to the person who made it. Try it. And Try it again. You need to teach your taste buds to like a new food. Be Grateful for the food we eat. Ok. Time to get to the reason you are really here. Are you ready? Here it is …. The exact TWO STEP formula I have used to get my children to learn to eat even the most dreaded vegetable (Brussel sprouts in case you are wondering). STEP 1: Put it on their plate. STEP 2: Try and try again. That’s it. Don’t complicate it. Don’t mess with the formula & most importantly – DON’T GIVE UP. Now before you think that this won’t work for your child, please read our story. This is my actual, real life, at the dinner table story on how I got my picky eater to eat broccoli. Once apon a time ….. My 12 year old son had a major issue with broccoli (we started the Real food thing a little late). An apocalyptic, raise the roof kind of issue with it. He would gag, cry, throw a massive ‘tanty’ and generally make dinner time a nightmare. I actually have this on film courtesy of his sister (I hope he never reads this). For years I ignored it. I thought that it was just his personal taste developing and that it would fix itself. But it didn’t. At first, I tried to force him to eat by getting mad, threatening him with taking away all sorts of his favorite things. Not a Mommy of the Year moment at all. Then I resorted to bribing and rewards. It all seemed to add emotion to the simple act of eating his vegetables. It was such a simple thing that had escalated into a drama. It was stressing the entire family out. So, I changed my tactic. I still put it on his plate, but I just asked him to take one bite. That’s it. One bite and we could all move on. I didn’t judge over the size of the bite. The family lightened up at the dinner table and it became a game. He smiled at the ridiculous of it and his resistance melted. He took a (very) little bite. Believe me, in the beginning they were mice size bites. Baby mice bites. I rewarded any effort at all with “Well done”. My son beamed. And I knew I was on to something good. Broccoli became a regular vegetable at dinner and his bites gradually got bigger. I began to focus on how little was left on his plate “Oh my gosh, you almost ate half”. “Oh my gosh, you finished it”. It took us less than one week to go from gagging on the smell to actually finishing the broccoli on his plate!! He was used to seeing broccoli on his plate, he knew what it tasted like. There was nothing to fight about anymore. ‘Experts’ say it can take children around 15 times to accept a new food into their diet. To be honest, I have never reached 15. Even the fussiest of my children will eat the offending food before that. They don’t love it, but they eat it. Using the same method, my son now eats broccoli, celery, spinach, cabbage, corn etc. On a side note, siblings are naturally competitive. I think its got something to do with Natural Selection. In other words it comes down to Science. If you praise one, the others work damn hard to get your attention on their plate. My other fussy child was so focused on ‘beating’ her brother that she ate her veggies purely to make her brother look bad. Hmmm. Might have to watch that one. Picky Eaters can be notoriously stubborn when it comes to trying a new food. You may be thinking, “Uh uh Carey. There is no way my child is going to fall for the one bite philosophy”. Don’t you worry, I have a few tricks – 22 actually – up my sleeve to help you make that “just try one bite” part of the plan a little easier. You can do something about the fussy eater in your home. I promise it will take the stress out of mealtimes knowing that they will be eating food that actually nourishes them without the fuss and fighting. One thing I love about this strategy is that it is surprising at how quickly it works. What’s worked for you? I would love to know if you have any strategies you have used to get your picky eater to eat their vegetables. Please share!